For this week's challenge please scroll down to the post below or click HERE!! Time flies when you are having fun!! And we are sure having fun here at La-La Land Crafts!! With that said we have to say goodbye to our November-December Guest Designers. We are very sad to see them go :-( Katie and Moon, we have really enjoyed having you on our team!! Elena and Kristine are staying with us and moving up to the Design Team!! Congratulations!! Now we would like to introduce you to our new Guest Designers for the months of January-February. We can't be more excited to have these very talented ladies join our team!!! Cheryl Rowley of Cottage Creations!! Thanks to my mother, I have been creating as long as I can remember! I had supplies for just about every craft imaginable-needlepoint, macrame, leather tooling, candlemaking, knitting and crocheting, painting, and well, you get the idea! Before coming to stamping I was in many a craft show selling my tole painted goods which had been cut by my dad and sanded for painting by my mom! It was fun and profitable for many years! I came to stamping about 12 years ago and love it more everyday! 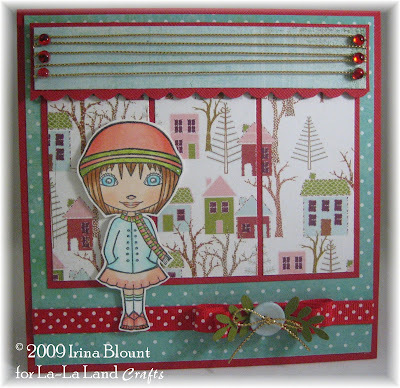 I'm so pleased to be a guest designer for Irina and La-La Land Crafts! and Pam Sparks of Expressions with Heart!! I've been married to my best friend Tim for 34 years! We have three married daughters….Heather, Amanda and Breanna and we have grandchildren!!! NINE of them! Wonderful, delightful, the joy of our lives! They love coming to G-ma Pam’s to do “art” as they call it! Course the Cricut is their favorite thing to do! The copics will be next I'm sure! My blog is expressionswithheart.wordpress.com. Welcome to the team Cheryl and Pam!! When you get a chance, please make sure to stop by our new Design Team members' and the Guest Designers' Blogs to congratulate them!! Hello there! 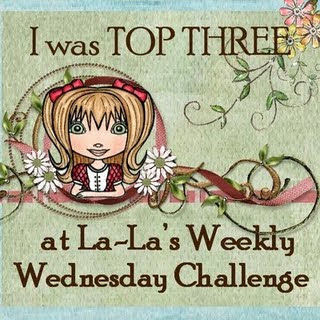 Welcome to another great La-La's Weekly Wednesday Challenge! I am Kathy and this week was my turn to pick the challenge. I decided to go with CHARMS. I hope this one isn't too challenging for you! Before we get to the rules and DT cards I just want to wish everyone a blessed New Year filled with love and laughter!! 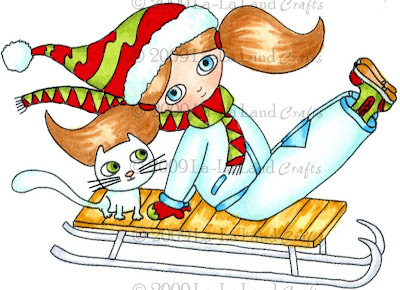 Thanks so much for your support to La-La Land Crafts and we all look forward to an exciting 2010! 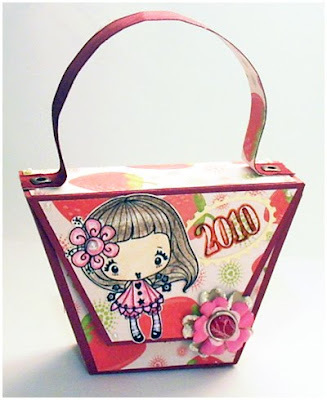 1) Create a NEW papercraft project for the challenge. You are more than welcome to combine challenges! by Monday, December 28th, 2009 at 11:59pm PST (GMT-8). 5)If you post your card on Splitcoast stampers, please use Keyword: LLWWC19. 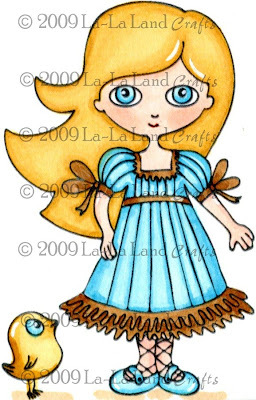 If you are also using a stamp from La-La Land Crafts, please use BOTH keywords LLLC and LLWWC19. Thanks so much for stopping by and we can't wait to see your creations with charms!!! 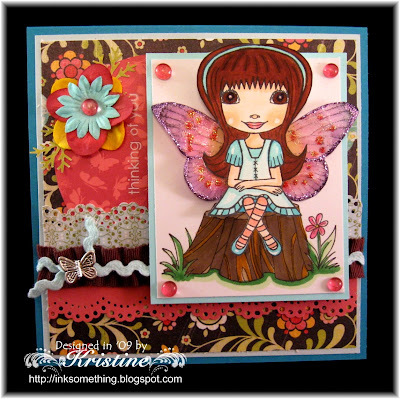 Thank you so much to everyone who had joined us for the FAIRY TALE Blog Hop last week. We had enjoyed your visits to all of our blogs and reading all your sweet comments. 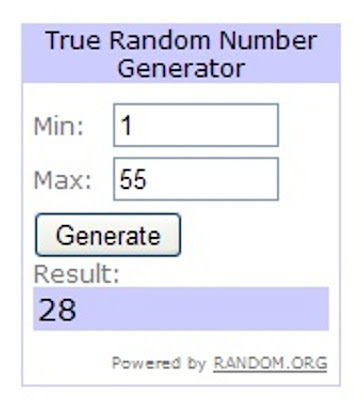 I have used random.org to pick the winning number, and the number is..
Love all your images and your cards totally rock! I hope to enter something for the challenge." 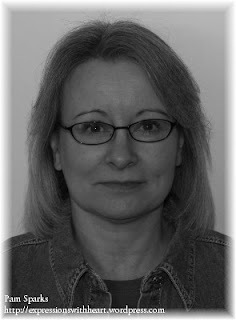 Kathy, please email Irina your mailing address and we will send you the package with all the goodies. Hello, Friends! It's Kim here. I am back to announce last week's ANYTHING BUT A CARD challenge winners. Every entry was AWESOME! Thank you all so much for playing along with us during the busiest time of the year! We had a great time checking out all your beautiful creations! Itzuvit, you are also the winner of Window Lala! Congratulations, Ladies! Please email Irina at info@lalalandcrafts.com for your adorable Top 3 button! Thank you, everyone for playing along! Please come back tomorrow for anther great La La Weekly Wednesday Challenge! La La Weekly Challenge #18 - Anything But A Card! Hello there! Welcome to another great La La Weekly Challenge! I am Kim Yu, your hostess this week. We are on week #18 already! Can you believe it? Time definitely flies in the blink of an eye! Did everyone have fun hopping and checking out the awesome DT creations with Princess Rosie? She sure is a cutie, right? Winner will be drawn later today so stay turned! by Sunday, December 27th, 2009 at 11:59pm PST (GMT-8). 5)If you post your card on Splitcoast stampers, please use Keyword: LLWWC18. 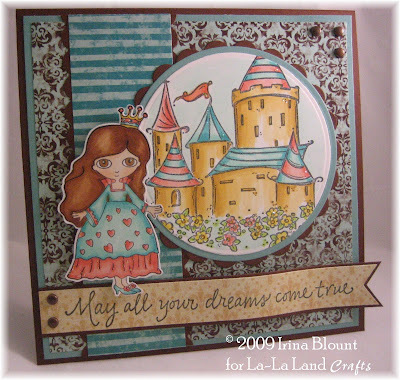 If you are also using a stamp from La-La Land Crafts, please use BOTH keywords LLLC and LLWWC18. 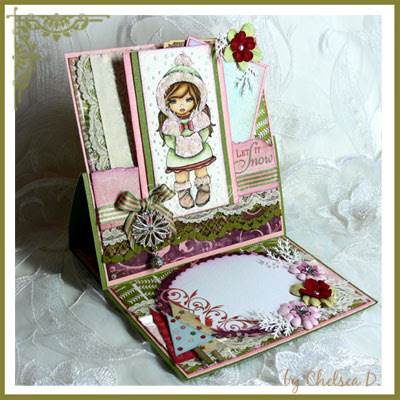 Welcome to La-La Land Crafts' Fairy Tale Release Blog Hop. To celebrate the release of our new Princess Rosie stamp, we are giving her the royal treatment that she deserves. Every member of our Design Team and the Guest Designers have made their cards with Princess Rosie which they are now showing on their blogs. 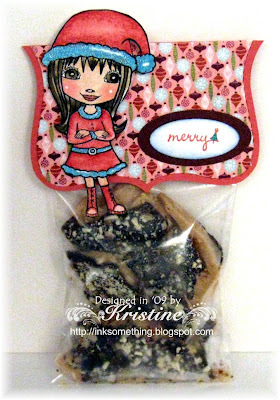 To make the Blog Hop even more fun, along with the cards you will find some clues (a secret word or two) on every blog. When you follow the order of the Blog Hop and get to the end, you will have collected all of the words and will be able to put them together into a sentence. When you are done, you will need to come back to La-La Land Crafts Blog and leave your comment under this post. What's even more? While on your treasure hunt for secret words, you might even find some more treats offered by our designers!!! And!! Best of all, I have some great news for you!! Princess Rosie stamp is already available for purchase in our online store (!!! ), here is the link. 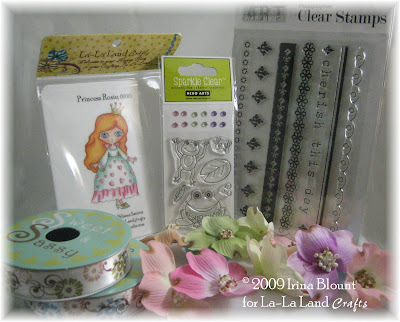 * Start your Blog Hop here at the La-La Land Crafts' blog. 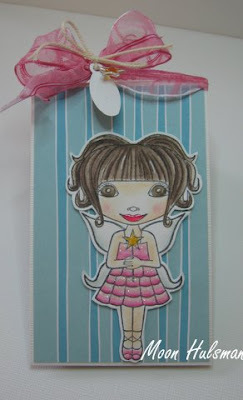 * Each DT Member will guide you to the next Blog during the Blog Hop. * Final stop is back here at La-La Land Crafts Blog where you have to leave your comment under this post. IMPORTANT!!! Do not reveal your answer in your comment!! We will contact the winner for the answer. If the answer is incorrect we will draw the winning number again..
One entry per person please. We will draw the winning number from all the entries next Wednesday, December 23rd, around 10 am PST. Everyone is welcome to participate. Even if you don't have a blog!! And, we will ship internationally!! To start you off on your journey, here is my first card with Princess Rosie. I am so happy with the way my card has turned out!! You can read all the details about my card and see more photos of it on my other blog, here is the link. Now... Hop, hop, hop to LISA's Blog to find your first clue!! Hello everyone! 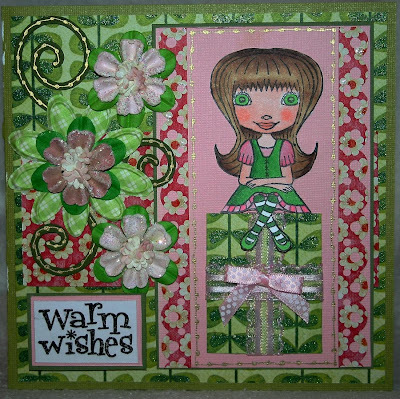 It's me, Lisa Hjulberg, back to announce the winners of La-La's Weekly Wednesday Challenge #16, which was to use pink and green (and a neutral of your choice) in your card/project. We had many wonderful entries to enjoy this week. Our sincere thanks to each of you for playing!! Christine, you are also the winner of Rosie With Bird! 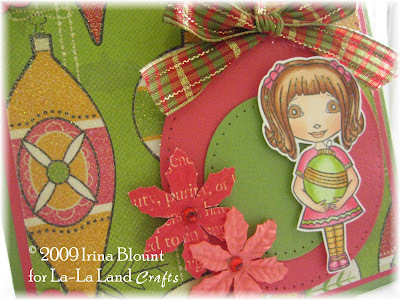 "Top Three at La-La Land Crafts" badge for your blogs! so please be sure to check back with us then! This card measures 4 1/4" x 5 1/2". 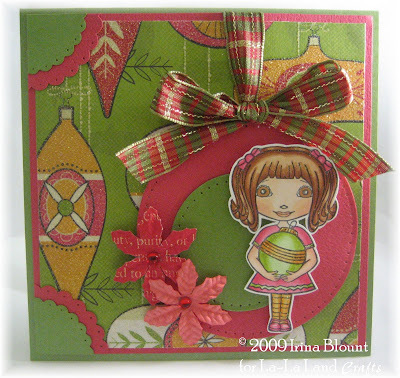 Window behind Lala is a stamp from Magnolia, you can purchase at Cranberry Hill Mercantile online store or call the store at 408-736-9151 to place your order. I cut out the window panels and place Snowflake vellum paper behind it. 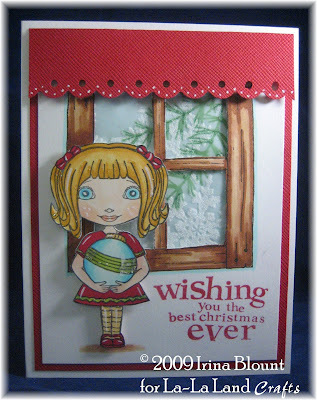 I have been hoarding this paper by Making Memories, it is only being used sparingly and for very special cards ;-) The branch in the window and the sentiment are from the same clear stamp set by Hero Arts (I have had it since last year, sorry.. don't know the name of this set). Fiskars border punch for the awning. 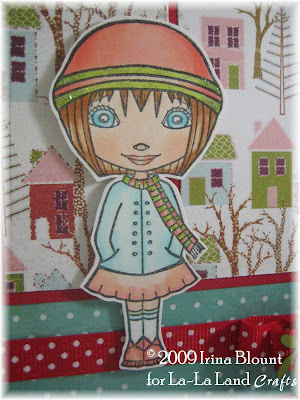 Ornament Lala was colored with Copic Markers, cut out and popped on the card with foam tape. 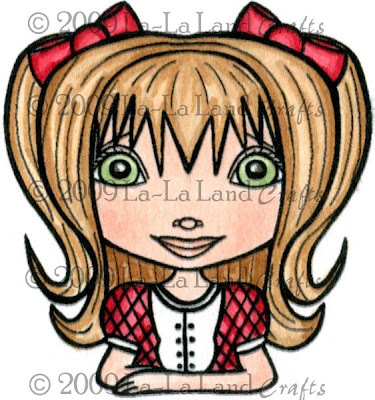 You can purchase this stamp along with others in our La-La Land Crafts online store, here is the link. 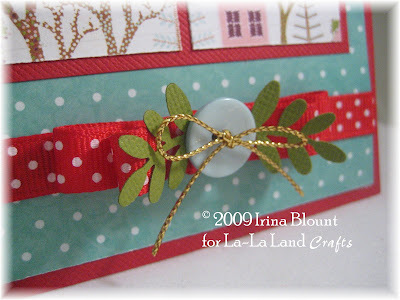 We will have a special treat for you on Wednesday right here on La-La Land Crafts Blog, make sure to come back!! Today is the first time I got to ink my Winter Lala stamp. She is so ADORABLE!!! 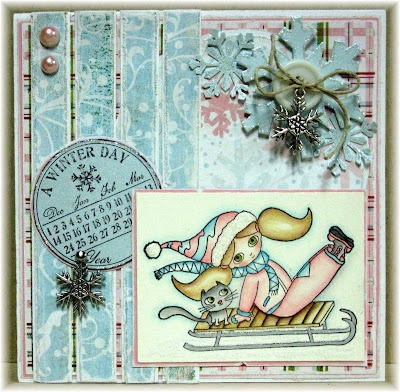 This stamp is not necessarily a Christmas stamp, it can be used for any winter occasion - Birthday, Thank You, Thinking of You or Just Because cards. BoBunny Designer paper, LOVE it!!! Fiskars Border punch. Ribbon and button are from my stash. EK Success leaf punch. Winter Lala was colored with Copic Markers. 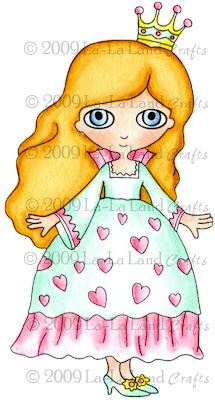 You can buy this and other La-La Land Crafts stamps in our online store, here is the link. There is still time to participate in this week's challenge on our blog, you have until Sunday 11:59 pm PST to enter. The challenge is PINK & GREEN, how fun is that??!! Click here for details and to see the samples made by LLLC Design Team and the Guest Designers. 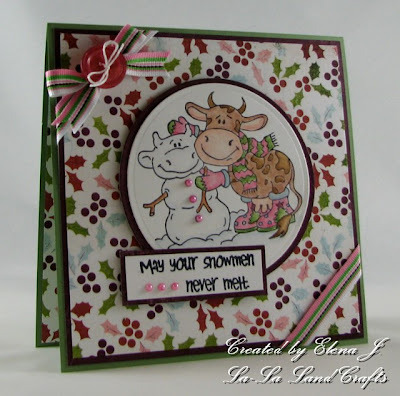 And here is my card for this week's challenge.. To see the cards made by my Design Team and the Guest Designers please scroll down to the post below or click here. 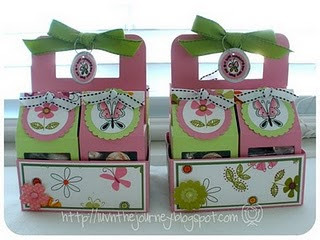 We are looking forward to seeing your Pink & Green projects this week, please list them with Mr. Linky on this post. 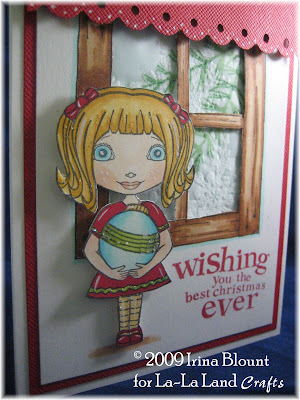 When I saw this absolutely GORGEOUS paper from We R Memory Keepers, I instantly knew that I was going to make a card with our Ornament Lala!!! Isn't it just perfect??!! And the colors.. it was meant to be ;-) Oh, oh, oh.. and this paper has tons of glitter all over the ornaments!!! Hard to see on photos though, you might have to enlarge them.. The corners were made by punching scalloped circles with Marvy punches, and cut in quarters. Hero Arts flowers. Mark Richardson rhinestones. Ribbon from Michaels. Lala was colored with Copic Markers and popped on dimensionals in front of the ornament that I made with two Nestabilites circles. 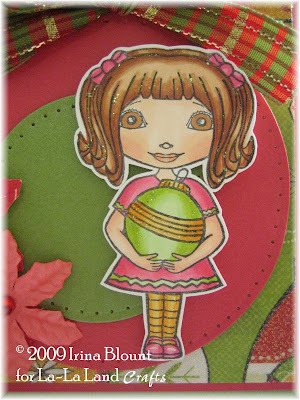 You can purchase this Ornament Lala stamp as well as all our stamps in our online store at La-La Land Crafts, here is the link. La-La's Weekly Wednesday Challenge #16 - Pink & Green! I'm Lisa Hjulberg, your hostess for this week's challenge. Before I get to the challenge, I want to thank everyone who participated in our Buttons Buttons Buttons challenge last week. Obviously, buttons are a favorite embellishment for many of us! There were so many wonderful cards/projects to see. Congratulations to our Top 3! I don't know about you, but I'm loving this year's Christmas colors of pink and green. Pink seems to be the new red, and apple green (or variations thereof) is the new shade of green for Christmas. 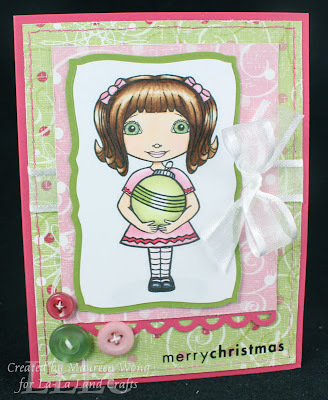 So this week's challenge is to use pink and green (and a neutral if you so desire) in your card/project. using pink and green (and a neutral if you so desire). by Sunday, December 13th, 2009 at 11:59pm PST (GMT-8). If you post your card on Splitcoaststampers, please use Keyword: LLWWC16. please use BOTH keywords LLLC and LLWWC16. and Guest Design Team have created for you!